All that glitters…and more! 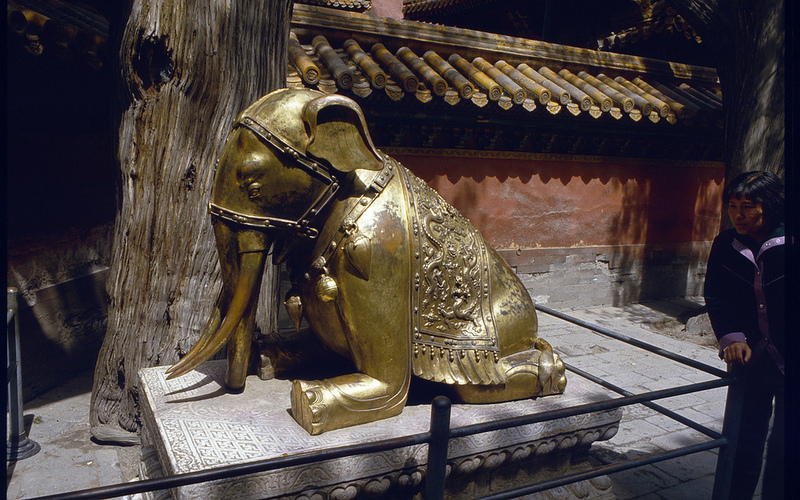 We need your treasures for our Golden Elephant Sale. If you find this little pachyderm irresistible, then we’ve got something to talk about! On Saturday, December 3rd–don’t laugh, it’ll be here before you know it!– the Friends will be holding a Golden Elephant Sale as part of Ridgefield’s Hometown celebration. What’s a Golden Elephant Sale? It’s a place for you to buy high-end, gently used or brand new items at ridiculously reasonable prices. These items are perfect for your holiday gift-giving lists: high-class goods that are oh-so-kind to your budget. Think of this sale as an up-scale White Elephant sale. But before we can have a Big Top Ballyhoo of a Golden Elephant Sale, we need you to donate YOUR new or upscale, gently used items. And we need them NOW! We’re looking for new or like-new gadgets, jewelry, collectibles, fashion accessories, home decor items, glassware, etc. NO clothing, please! Think of the kind of items you would likely see in a nice vintage or recycled items shop. Or items that could be regifted without any hullaballoo. To donate items call Ilia (360-727-3387) or Vicki (513-335-0955) NOW. Then, on December 3rd, come to the Ridgefield Community Center with your holiday shopping list in hand and get ready to buy, buy, buy and save, save, save! Everything you do (donating items and buying gifts at the sale) will benefit the Ridgefield Community Library! The Friends of Ridgefield Library applaud this community. You are so supportive of YOUR public library! On Saturday, November 17, from 9-11 am AND Saturday, December 3, from 9-11 am, Ridgefield’s renowned artist, Kathy Winters, will expertly guide you in creating your very own Christmas cards in watercolor, ready for personalizing, signing and sending. The fee for the class is $45 ($40 if you’re a member of the Friends of Ridgefield Library). All proceeds benefit the Library Building Fund and current library programs. Truth and Beauty: A Writing Workshop Just for YOU! All right, class. Connect to your inner (fill in an inspirational author like Dr. Seuss). Give me verbs and nouns. Make your words profound. Make them from your heart. Make them really smart. Um. This is not a poetry workshop. WHY WOULD I BE INTERESTED IN A WRITING WORKSHOP? Writing can be personal or utilitarian, fiction or fact, occasional therapy or a routine requirement of your job. Regardless of what role writing plays in your life, this writing workshop is for you. In four weekly two-hour sessions, learn how to become a better, more confident wordsmith. In this workshop, you will learn how to organize your thoughts, structure your message, create the effect that you want with your words, learn basic self-editing techniques, and get tips about how to publish your work. The essays you write and hone in this workshop will (if you choose) become part of an anthology of essays entitled, More than a Dream: Stories about what Matters Most, and will be published and sold as another future fundraiser for the new Ridgefield library. So if you want to become a published author (or bolster your portfolio), this is a great opportunity for you! The $75 fee for eight hours of instruction is tax deductible because it goes directly to help build a new Ridgefield Community Library. No, that’s not Princess Di. That’s me! Lorna Earl, Ph.D. was a sociology professor who taught, published many academic papers in professional journals and conducted research in both private and public universities on the east coast for over twenty years. Creative writing has been her path since her premature disability retirement due to Chronic Fatigue and Immune Dysfunction Syndrome in 2006. That and pretending to be Princess Di, which hasn’t worked out very well. Lorna has written two successful self-published books. Her first book, How Was I Supposed to Know? was awarded Best Memoir, 2012 by the Adirondack Writing Center. Never Turn Back is her second book and her first historical fiction novel. In 2010, she was a finalist in the memoir genre of the national Writer’s Digest Annual Writing Contest with her short story, Monkey Business. Her recent short story, Tomb Therapy, won second place in the 2015 Susan Albert Story Circle Life Writing Contest and was published in the Women’s Story Circle Journal. Two of her current short stories have been published in The Columbian. She is certified as a copy editor and belongs to the Amercian Copy Editors Society. Her first set of fundraising workshops about writing life stories (offered May-June, 2015 and October-November, 2017) were so popular that she was asked to offer more writing workshops. Since Lorna misses teaching and loves to help people as they work to attain their goals, she was happy to donate her time and talents once again. Lorna lives in Ridgefield, Washington. As a person committed to lifelong learning and a believer in the integral role that public libraries play in personal and social development, Lorna is donating all the proceeds of this writing workshop to support the construction of the new Ridgefield Community Library. Doesn’t she sound like someone who you would like to meet? There is no advanced registration. Just come to the Ridgefield Community Center on April 21 (Thursday) at 1:30 ready to learn to write better right now! Your $75 tax deductible fee will be due on the first day of the workshop. If you write a check, make it payable to The Friends of the Ridgefield Community Library (write small!). Still have questions? EMAIL Lorna! The countdown is upon us. If you still have some of those I-never-know-what-to-give-them people on your gift-giving list, consider this. Make a charitable contribution to help build a new Ridgefield Community Library in those people’s names! Wow! What a great gift that will keep on giving well into the future. And you don’t need a lot of wrapping paper. Green and community-minded: the perfect Ridgefield gift! Yes, some kitties…er, um, people love to wrap presents. But then there are the rest of us who are prone to paper cuts, need some rest and have to simplify our lives. Do you find that ribbons tend to complicate life? Think about it…but don’t wait too long. December 25 is almost here! If you can’t help us during the Holiday Home Tour, we’re going to have to rely on her…and we have a strict “No Smoking” policy! 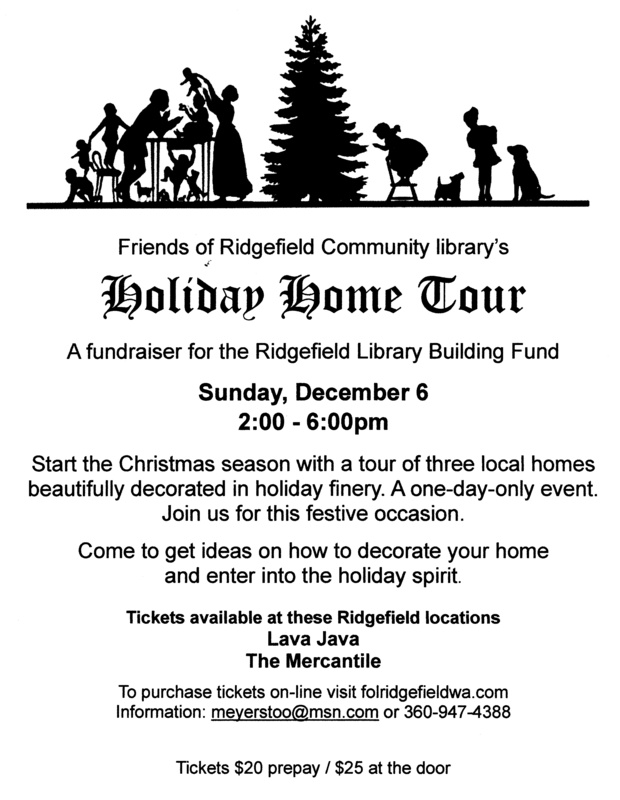 We hope you already know about the fabulous Ridgefield Holiday Home Tour on Sunday, December 6 from 2:00 to 6:00 pm. We need docents (hosts) for either the 2-4 pm shift or the 4-6 pm shift. Great question! Anyone who cares about the Ridgefield Community Library because this is an event to help build the new library. If you love holiday decorations, you’d be a perfect person to volunteer, too! Adults and responsible teens click here to contact Jean Meyers to volunteer to be a docent for the Holiday Home Tour. Hope to see you there and thanks so much for being neighborly! Is it that time to decorate for the holidays already? If you need a little inspiration to make your home truly sparkle this holiday season, we have just the event for you. Set aside some time on the afternoon of Sunday, December 6, to tour three (3) Ridgefield homes decorated in high-style for the holidays. Prepare to be both wowed and inspired. While you’re at it, gather ideas for decorating your home. To purchase tickets in advance click this purchase link. Major credit cards welcome. All monies collected go to help build a new, bigger, better Ridgefield Community Library. The cost of your ticket, then, is tax-deductible! Does anyone have one of these to donate for our Golden Elephant Fundraiser? On Saturday, December 5th, from 10:00 am to 3:00 pm, the Friends will be holding a Golden Elephant Sale as part of Ridgefield’s Hometown celebration. What’s a Golden Elephant Sale? It’s a place for you to buy high-end, gently used items at ridiculously reasonable prices. These items are perfect for your holiday gift-giving lists: high-class goods that are oh-so-kind to your budget. Think of this sale as an up-scale White Elephant sale. But before we can have a really great Golden Elephant Sale, we need you to donate YOUR up-scale, gently used items. NO clothing, please! We’re looking for new or like-new gadgets, jewelry, collectibles, fashion accessories, home decor items, glassware, etc. Think of the kind of items you would likely see in a nice vintage or recycled items shop. Then, on December 5th, come to the Ridgefield Community Center with your holiday shopping list in hand and get ready to buy, buy, buy and save, save, save! Everything you do (donating items and buying items at the sale) will benefit the new library building fund! To donate items call Ilia (360-727-3387), Jan (360-887-4288), or Donna (360-887-2200). Pie Making Can be as Easy as Pie. Learn How! Easy as pie? 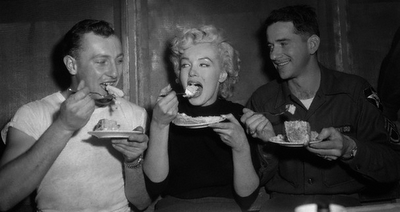 Maybe eating pie! At least until now. Want to impress your friends and family just in time for the holidays? Learn to make a truly great pie (berry or pumpkin) with a professional chef, Meredith Robertson, as she hosts a pie-making workshop. Space is limited to 15, so sign up today by clicking on the following link. Be sure to tell Donna which type of delicious pie you want to make (berry or pumpkin).